Finance reporting and management efficiencies of more than $408,000. Greater revenue enabling a new operating margin of more than $1.2 million with more and larger sales. Reduced and avoided IT costs of almost $749,000, including the retirement of servers, applications, and services. Better business visibility and decision making, improved customer satisfaction, and readiness for growth. Inspirria ServiceEdge is a native SuiteApp that supports management of work orders, contracts, warranties, parts, and scheduling for organizations that service high volumes. The app offers true end-to-end service management as it integrates with CRM systems, inventory, billing, accounting and other back-office systems. This makes the entire lifecycle from quoting to installation to repairs to billing completely seamless. When a sales order is created, AMC contracts and services are auto created with terms and conditions . In the case of installations, the system can quote labor, materials as well as plan and allocate resources. Billing has flexible options with validation with contracts and can be done on a weekly, monthly or yearly schedule. The integration also allows field technicians to have a direct effect on NetSuite sales and purchase orders. 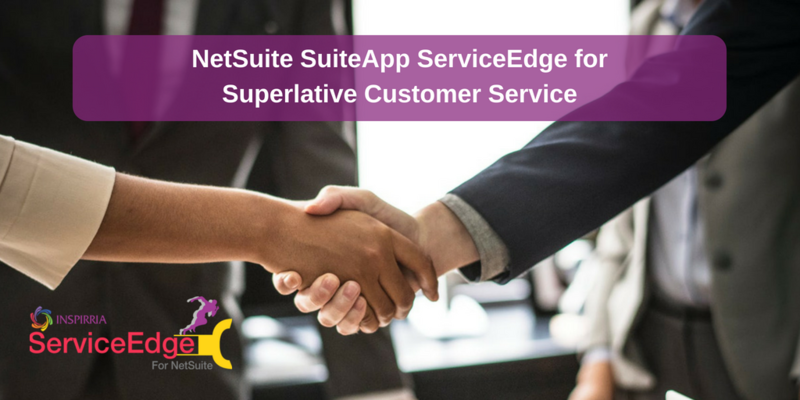 Comprehensive functionality with industry-specific support proves that NetSuite is perfect for your business. Finally, remember that the software us built for the cloud, and that lowers costs and reduces hassle for IT. With more than 14 years of experience in cloud technologies and over 550 clients around the world, we have collaborated with innumerable global companies across industry verticals. Inspirria’s rich industry experience, coupled with its cloud-based strategic service offerings, has helped businesses drive operational excellence and improve ROI. Through our data-driven strategic cloud assessments, companies are able to gain better business value.